Jitka´s father (Frantisek Pergler) died when she was about 6 years old. He was a policeman and he was killed in Bratislava. Jitka´s mother (Alzbeta Pollakova Perglerova) died in the hospital, likely in Brno when Jikta was about 2.5 years old. Jitka was an orphan and she did not know much about her family. Jitka's brother, Milos Pergler, was born around 1923 - 1924. Milos lived in Litomysl in Czech Republik many years ago. 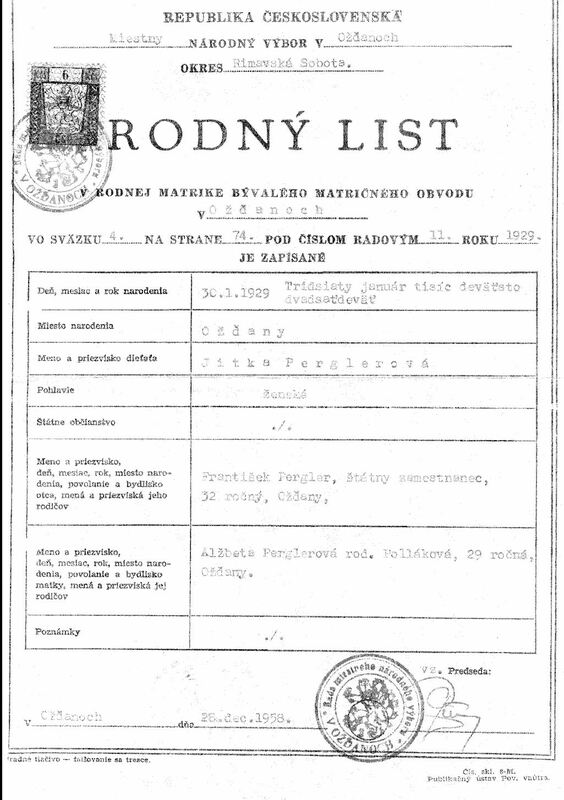 Jikta did not have to move from Slovakia to Czech protectorat in 1939 as a child of Check parents because of her "uncle" Karl Pergler who signed the Pitsburgh treatment which was greatly appreciated in the so called "Slovak Republic" in 1939. Jitka passed away on 23 June 2010 as Jitka Krovinova, born Pergler. Jitka's parents (Frantisek & Alzbeta) were not born in Ožďany, but were only living there when Jitka was born. Alzbeta may have been born in Moravia, Czech Republic. Jitka mother, Alzbeta, indicated that Karel Pergler (1882-1954) was from her family.